Published Aug 3, 2015 by Que. Part of the LiveLessons series. The easy hands-on video guide to preparing outstanding presentations: personal training from two of the world’s top presentation experts! How to Deliver Great Presentations LiveLessons gives you all the skills you’ll need to inform, persuade, motivate, entertain... and get outstanding results!These easy video tutorials will show you how to deliver powerfully compelling presentations, whatever your audience, goal, or environment! 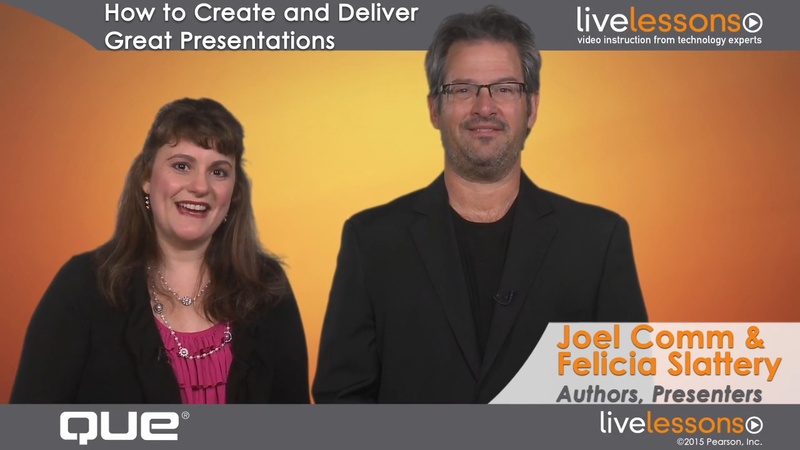 In just six hours, top presentation experts Joel Comm and Felicia Slattery help you focus on providing real value and service, based on a deep understanding of what your audience wants and cares about. Next, they show how to structure your presentation so it’s easy to guide your audience to the decision you want. Learn how to craft outstanding introductions and conclusions, use visuals and storytelling to engage your audience, build PowerPoints people actually like, make the most of your voice and body, present via webinars and online video, practice, prepare, overcome the fear, and excel! How to create content that audiences will love–without overwhelming them with too much information! No requirements at all: absolutely no speaking, training, or teaching experience needed! Discover the true purpose of presenting: providing value to your audience through effective communication. Next, seriously consider your audience, their values, and their needs, to set the stage for preparing your content. Use proven persuasive organization patterns to organize and structure your professional and business speeches for maximum effectiveness. Learn to stand out from the crowd whether your goal is to inform, persuade, or entertain. Begin and end your presentations in style, with the greatest persuasiveness. Use visuals and stories to maximize your impact and powerfully reinforce your message. Systematically guide your audience where you want them to go. Master effective delivery techniques that combine information with entertainment value. Learn to use your voice, move your body, and interact with your audience. Discover how to practice, prepare, and overcome the fear! Connect with your audience through social media, webinars, video, and other technologies. LiveLessons Video Training series publishes hundreds of hands-on, expert-led video tutorials covering a wide selection of technology topics designed to teach you the skills you need to succeed. This professional and personal technology video series features world-leading author instructors published by your trusted technology brands: Addison-Wesley, Cisco Press, IBM Press, Pearson IT Certification, Prentice Hall, Sams, and Que. Topics include IT Certification, Programming, Web Development, Mobile Development, Home and Office Technologies, Business and Management, and more. View all LiveLessons on InformIT at http://www.informit/livelessons.